AMD announced the acquisition of ATI in 2006. By 2007 AMD had a plan for CPU/GPU integration and it looked like this. The red blocks in the diagram below were GPUs, the green blocks were CPUs. Stage 1 was supposed to be dumb integration of the two (putting a CPU and GPU on the same die). The original plan called for AMD to release the first Fusion APU to come out sometime in 2008—2009. Of course that didn't happen. Brazos, AMD's very first Fusion platform, came out in Q4 of last year. At best AMD was two years behind schedule, at worst three. So what happened? AMD and ATI both knew that designing CPUs and GPUs were incredibly different. 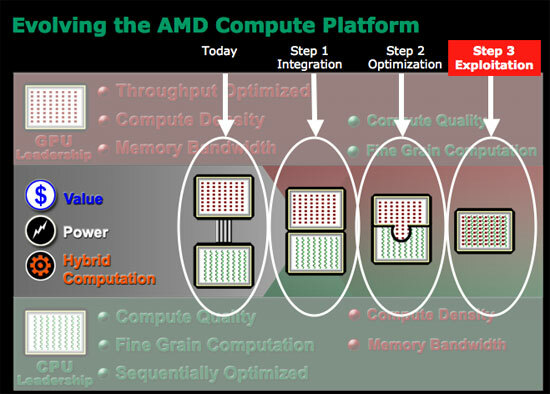 CPUs, at least for AMD back then, were built on a five year architecture cadence. Designers used tons of custom logic and hand layout in order to optimize for clock speed. In a general purpose microprocessor instruction latency is everything, so optimizing to lower latency wherever possible was top priority. GPUs on the other hand come from a very different world. Drastically new architectures ship every two years, with major introductions made yearly. Very little custom logic is employed in GPU design by comparison; the architectures are highly synthesizable. Clock speed is important but it's not the end all be all. GPUs get their performance from being massively parallel, and you can always hide latency with a wide enough machine (and a parallel workload to take advantage of it). The manufacturing strategy is also very different. Remember that at the time of the ATI acquisition, only ATI was a fabless semiconductor—AMD still owned its own fabs. ATI was used to building chips at TSMC, while AMD was fabbing everything in Dresden at what would eventually become GlobalFoundries. While the folks at GlobalFoundries have done their best to make their libraries portable for existing TSMC customers, it's not as simple as showing up with a chip design and having it work on the first go. As much sense as AMD made when it talked about the acquisition, the two companies that came together in 2006 couldn't have been more different. The past five years have really been spent trying to make the two work together both as organizations as well as architectures. The result really holds a lot of potential and hope for the new, unified AMD. The CPU folks learn from the GPU folks and vice versa. Let's start with APU refresh cycles. AMD CPU architectures were updated once every four or five years (K7 1999, K8 2003, K10 2007) while ATI GPUs received substantial updates yearly. The GPU folks won this battle as all AMD APUs are now built on a yearly cadence. Chip design is also now more GPU inspired. With a yearly design cadence there's a greater focus on building easily synthesizable chips. Time to design and manufacture goes down, but so do maximum clock speeds. 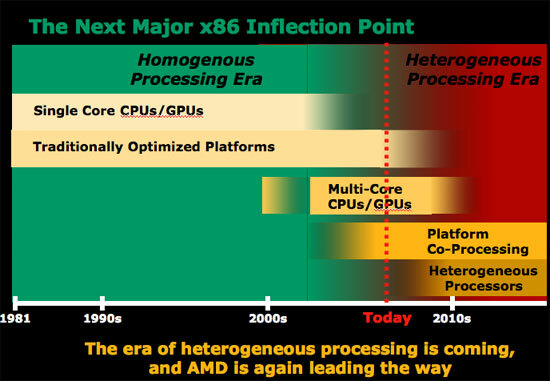 Given how important clock speed can be to the x86 side of the business, AMD is going to be taking more of a hybrid approach where some elements of APU designs are built the old GPU way while others use custom logic and more CPU-like layout flows. The past few years have been very difficult for AMD but we're at the beginning of what may be a brand new company. Without the burden of expensive fabs and with the combined knowledge of two great chip companies, the new AMD has a chance but it also has a very long road ahead. Brazos was the first hint of success along that road and today we have the second. Her name is Llano. I dont get all the talk of $600-$800. There is fundamentally no reason why we wont see these chips in $449 back to school specials, or black friday specials. It is only $50 more in parts vs what we're seeing on slickdeals for $400. Intel managed to book a bunch of Quad+Discrete while preventing any dual+HD chips in this review providing a fine level of reality distortion field. eh, while this offers modest improvements over sandy bridge in games, the general cpu performance is pretty poor. If gaming is that important to you, then you won't be happy with EITHER IGP, so you'll still be better off with sandy bridge (paired with another gpu).